Two sites staggered between junctions, with no public connection between them. Only the northbound side, which offers a café and a petrol station, is signposted as a service area. There is an additional facility on the southbound side. Today the southbound side has no signs from the road, but offers an independent café and motel. Until November 2012 the restaurant was a Little Chef, and until 2013 the motel was a Travelodge, which had been built in 1987 as a Little Chef Lodge. More curiously, the southbound restaurant was built by Roadchef, as part of their early expansion. It was called Green Acres services after a facility which previously existed here. It had an Amoco filling station and opened in around 1974. It was sold within a few years. 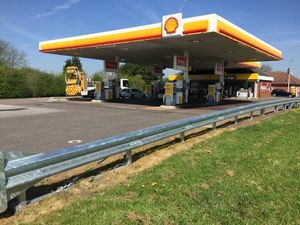 On the northbound side, the Shell forecourt, which provides the main facility, was Total until November 2012. The café is a converted bungalow with parking in the back garden. Both services are sometimes referred to as 'Six Hills'.